Meyer Consulting Engineers Coropration (MCE) specializes in Structural Engineering, Parking Consultations, Construction Material Testing and related professional services for the construction industry. Meyer Consulting Engineers has a proven track record of superior on-time performance, and cost-effective engineering design. Headquartered in downtown Rockville, MCE has completed over 12,000 commissions across the United States, Europe and Asia. Included are several current high-profile projects such as the new Fulton Street Transit Center Complex for the MTA in New York City, the new SSA National Support Center in Urbana MD, and the Rockville Town-Square among many mixed use, commercial, retail and residential facilities. 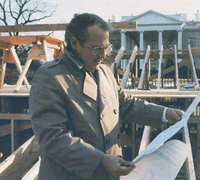 The recipient of various industry awards, MCE’s commitment to excellence is evidenced by its being selected to design and inspect the 1989, 1993, 1997, 2005, 2009, 2013 and 2017 United States Presidential Inaugural Reviewing Stands, provide specialized civil/structural consultation for the new $40 million Air Force One Hangar at Andrews Air Force Base, furnish CQC & construction inspection for the White House Communications Center in Anacostia, and function as the overall prime design consultant for the renovation of the 250,000 square foot US General Accounting Office Underground Parking Garage in Washington, DC. MCE provides development and implementation of the government required Contractor Quality Control (CQC) programs in design, inspection, and materials testing. We provide value engineering studies to determine cost effective construction and design solutions along with providing specialized forensic engineering and testing in failure analysis studies. Our team performs Expert Witness Testimony & Consultation. Meyer Consulting Engineers Corp. seeks a Project Designer for Rockville, MD office. Duties: structural analysis & prelim. engineering design of steel, reinforced concrete, wood & masonry for buildings. Work is performed under supervision of a licensed Prof. Engineer. Min. reqs: BS in Civil or Architectural Eng’g +2 yrs exp. Employer will accept foreign degree equiv to US BS. Must have 2 yrs exp. in structural analysis & prelim. design, inc. 1 yr exp. w/ AutoCAD & computer-aided structural design software in analyzing construction materials like steel, concrete, wood, & masonry. Email resume and salary requirements to ekelly@mcecorp.com.